The Behringer Control series are general purpose MIDI controllers. They are quite popular among users of digital mixing and synthesizer software. The firmware of these devices can be updated by sending special midi messages. This package contains the tools generate these midi messages from a firmware image and vice versa, and to upload them. This development kit was created to promote interoperability of Behringer Control devices, and to allow fixing errors by the community. It is not allowed to use this for creating commercial clones of these devices. Note: This software is unofficial and based on reverse engineering efforts. Although unlikely, reprogramming your device may actually render it dysfunctional and unrecoverable without physically opening it and reprogramming the flash chip by other means (bricked). Care has been taken to prevent this, but it is not impossible. You have been warned. README explains the tools bcfwconvert and bcfwflash. README.firmware explains how to run the examples and how to create your own firmware. Development code is available at the bc2000-dev bazaar repository. The Behringer Control devices BCF2000 and BCR2000. A yahoo user group about these devices. 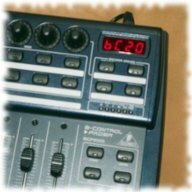 Comprehensive documentation on Behringer Control MIDI and preset programming. CPU: OKI ML671000 with 12MHz external crystal. The users' manual is what you need, but general information on ARM programming is useful as well, such as the technical reference manual. 512k of flash memory: TMS418160. A Photoshoot of a disassembled BCR2000. Embedded C-library for ARM is newlib (see also this howto). Last updated: August 13 2014 15:45:23. Copyleft by Willem van Engen.